Valente, C.M. (2011). The girl who circumnavigated Fairyland in a ship of her own making. New York, NY: Feiwel and Friends. Subjects: Girls, Fairies, Dragons, Good and evil, Omaha (Neb. ), Magic, Fairytales. The Earth is not round, but more trapezoidal, rhomboid and Tesserect combined…Huh? The Girl Who Circumnavigated Fairyland in a Ship of Her Own Making by Catherynne M. Valente is a middle grade reader that combines characters, predicaments, and settings from every fairytale, legend, and mythology one could imagine. Still, Valente’s fantasy is refreshing and new in this modernized Victorian fairytale. September, a 12-yerar-old girl from Omaha Nebraska, is invited by the Green Wind flying on the Leopard of Little Breezes for an adventure in Fairyland. Along her journey she discovers everything isn’t how she expected from all the fairytale stories she has read. The inhabitants of Fairyland are living lives of sorrow due to their tyrant ruler, the marquees, a young girl with color changing sausage curled hair and a marvelous top hat. September meets Latitude and Longitude who are very much living beings, two good natured fortune telling witch sisters that share a werewolf as their husband, A-L, a book loving wyvern, like a dragon, a girl made entirely out of soap, Saturday, a magical blue boy trapped in a lobster cage, alchemists that want her join their school, a migrating herd of bicycles, sandals that attempt to kill her, death that takes a liking to her, and a 112 year old lantern that wishes to join her travels. Regardless of all of September’s wisdom and logic, she chooses to lose her heart, sacrifice her shadow to save the life of a little girl, helps the evil marquees retrieve a magical object to save the life of her new friends, and becomes a tree in the province of Fall in which it’s always Halloween. 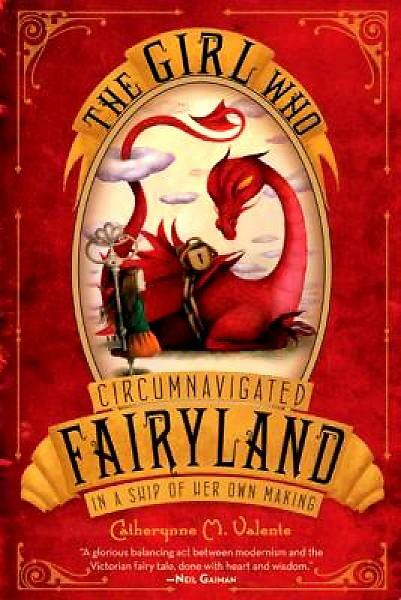 The Girl Who Circumnavigated Fairyland in a Ship of Her Own Making is an enchanting, amusing, mysterious, suspenseful, and even a perplexing fairytale. The illustrations found at the beginning of each chapter by Ana Juan are a gem and add to the bizarre world of Fairyland. Fairyland’s setting may remind many readers of Alice’s Adventures in Wonderland or The Wonderful Wizard of Oz. And September, well, she’s easily as brave and self-sacrificing as Lyra in The Golden Compass and even as talented and clever like Hermione in the Harry Potter series. And of course, there’s already a sequel, The Girl Who Fell Beneath Fairyland and Led the Revels There.